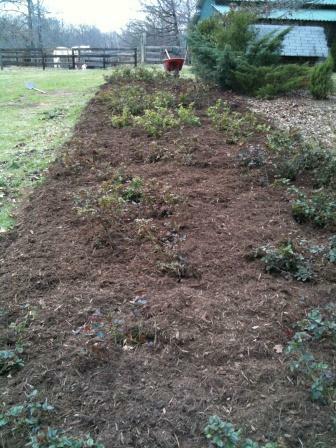 Nothing like a bed of newly planted and mulched roses! If you ever bought roses via mail order you’ve encountered bareroot roses. Even many local garden centers sell them this way and those roses you buy in plastic sleeves are also considered bareroot roses. Opening a package of bareroot roses and suddenly being faced with a plants and no dirt can be a bit intimidating. Yet, planting them is really not that difficult and we’ve done a video giving you a simple system from what to do when the plants arrive – to actual planting – to when you should start feeding. When dealing with bareroot roses keep this one simple rule in mind. Do not let they dry out. You can keep them in a bucket of water for up to 48 hours, heel the roots in most soil; even keep them wrapped in plastic in a dark cold cellar. We also deal with two questions that always come up when planting bareroot roses. 1) How big should the hole be? 2) Should I bury the bud union? We hope our one answer fits all solution will clear this up for you. When you are done mulch, mulch, mulch! Don’t fertilize until you see about 3-5 inches of new growth.